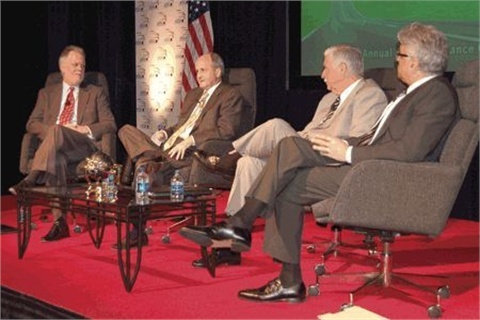 Kevin Westfall (L) warned finance sources not to eliminate dealer participation during a roundtable discussion at the 2010 Vehicle Finance Conference. He was joined by dealers Forrest McConnell, Stephen Wade and Ed Tonkin. FORT LAUDERDALE, FLA. — Kevin Westfall, who has twice served as a keynote speaker at the magazine’s annual conference, resigned from his post at AutoNation Inc. on Nov. 9 to pursue other opportunities, according to the company’s Nov. 14 filing with the Securities and Exchange Commission. Westfall, who served as senior vice president of sales, officially left the company on Nov. 11. The company could not be reached for comment, but it did report in its SEC filing that David Koehler, a market president in the company’s Florida region, was promoted to the position of senior vice president of variable operation. In connection with Westfall’s departure, the company entered into a separation agreement with its former executive that will pay him his current salary of $482,040 until May 2012. In addition, he’ll receive a prorated performance bonus for 11 months of 2011. The agreement also contains a non-compete clause. While at AutoNation, the country’s largest dealer group, Westfall was known as the company’s F&I chief, monitoring F&I performance levels at individual stores. He also served as the president of AutoNation Financial Services, the dealer group’s former captive finance company, from 1997 to 2001. He also served as the president of BMW Financial Services, where he helped launch the company’s captive finance arm. Westfall was a staunch defender of dealer-arranged financing, warning finance sources at the 2010 Vehicle Finance Conference not to eliminate dealer participation. Westfall also was a key supporter of technology at AutoNation, and played a key role in the implementation of CoinData’s docuPAD, an interactive F&I selling system that places a touchscreen display into an F&I manager’s desk. “Our goal wasn’t just to be an average or good dealer, we want to lead the industry, and we spend million and millions of dollars trying to improve our process,” he said during his keynote address at the magazine’s 2010 F&I Conference and Expo. Westfall also served as a keynote speaker at the 2007 event.